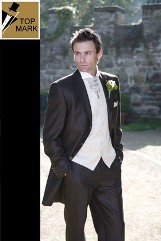 26 Years in the wedding trade At Top Mark we specialise in the provision of mens and boys formal wear. We have a wide choice of styles and sizes available with a range of comprehensive packages which are designed to meet any requirements you may have. Our knowledgeable staff give the best fitting advice and can help you choose the suits and accessories that are most suitable for your function.